Active duty military personnel who are having financial problems with their mortgage payments have some avenue of help under the Soldiers and Sailors Relief Act which can be very beneficial to them and to their families. The provisions of the SSRA apply to active duty military personnel who had a mortgage obligation prior to enlistment or prior to being ordered to active duty (for Reservists). This includes members of the Army, Navy, Marine Corps, Air Force, Coast Guard, as well as commissioned officers belonging to the Public Health Service and those in the National Oceanic and Atmospheric Administration (NOAA) who are engaged in active service. Military reservists ordered to report for military service and those persons ordered to report for induction under the Military Selective Service Act as well as guardsmen called to active service for more than 30 consecutive days are also covered under the act. In the area of home mortgage protections, the act limits the amount of mortgage interest that may be charged on home loans incurred by a service member (including debts incurred jointly with a spouse) before he or she entered into active military service. 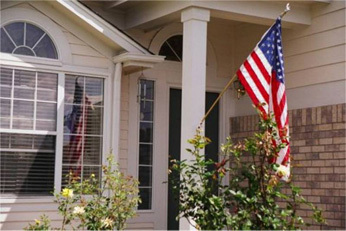 Once requested by the home owner, mortgage lenders must reduce the interest rate to no more than six percent per year during the period of active military service. They must also recalculate future payments to reflect the lower rate. This provision applies to both conventional and government-insured mortgages. It is important for those covered by the act to understand that this is not an automatic system. In order to request temporary interest rate reduction, you must send in a written request to the lender. This submission must include a copy of your military orders. The request may be submitted as soon as the orders are issued but must be provided to the lender no later than 180 days after discharge from active duty military service. Some of those who are covered by the act may find that they cannot make the payments even at the lower rate. If this happens, the lender may let the member stop paying on the principal while the member is on active duty. They are not mandated to do this, but many of them will. The amount that is adjusted will still have to be paid but at a later time, once active duty service is completed or financial status of the member improves. It is also important to know that many home mortgage lenders have other programs available to help those in need. If you or your spouse should fall into this category, contact your lender immediately and ask about loss mitigation options. For those with FHA insured loans who are finding it difficult or impossible to make the required payments, FHA has special forbearance and other loss mitigation options that you may be eligible for. Lastly, those covered under the act should know that mortgage lenders may not foreclose, or seize property for failure to pay, while a service member is on active duty. They may not do foreclose, as well, within 90 days after discharge without court approval. In order to get court approval, the lender would need to prove that the service member’s ability to repay the debt was not affected by his or her military service. You can learn more the Soldiers and Sailors Relief Act online or at your military base. I know of a friend who would benefit from this, I will pass him your link.